On this week’s AviatorCast we are joined by the one and only Karlene Petitt. 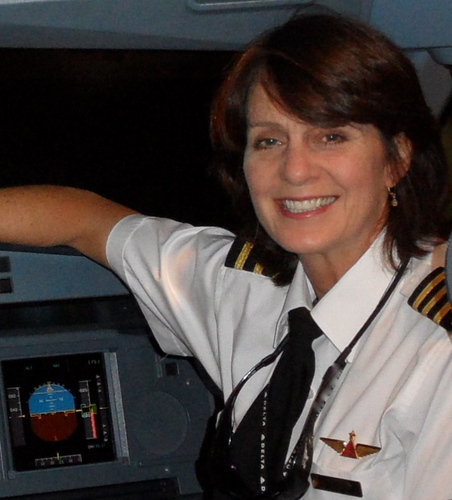 Karlene is a seasoned airline pilot flying for an international legacy carrier. She is also a stellar author, having written several fiction based educational books on different aviation topics. Her latest work is ‘Flight to Success’. Karlene is passionate about aviation safety, sharing aviation in the community, reaching for your dreams (aviation or not) and doing something that matters with your time. Join us as we learn from someone that has ‘been there’ and ‘done that’, yet still enjoys every step of the journey. Karlene, again, thanks for joining us on the show. Good luck at the NW Aviation Conference, and congratulations on the recent release of Flight to Success. We wish you all the best success with it! This is AviatorCast episode 58, pushing back from the gate! Chris: Welcome, welcome, welcome aviators. You’ve landed at AviatorCast. My name is Chris Palmer. There is nothing quite like riding the still air, only broken by the sheer vibrations of a turning prop and power plant up front. Suspended high above with a new perspective below, this is where I am at my best and that is flying. So welcome to this, the 58th episode of AviatorCast. It is my absolute pleasure to have you here, part of our podcast each and every week. I hope you’re enjoying the show and the guests that we bring on the show. We generally bring on inspiring and great aviators to get on and give us all that energy that keeps us going, that keeps us flying and keeps us improving as aviators. In addition, we talk about a lot of different training topics each week and we also get into some simulation stuff as well. This week, we have a long time airline pilot and author with us. Her name is Karlene Pettit. She is a fantastic person and just really involved in the flight community, out there trying to get things done all the time, trying to improve safety. She’s just come out with a great fantastic book that we’re going to be talking about. But above all that, you just get the sense that this is someone that’s passionate about their career and has remained passionate after all of these years. So this is a great interview. We don’t have a lot of news this week. We’re going to let it gather up a little bit and we’ll share that more next week. So we’re going to get right into the interview this week with Karlene Pettit so here we go. Here is Hangar Talk with Karlene Pettit. Chris: Alright everybody, we are honored to have a very special guest with us today, Karlene Petitt. Welcome to AviatorCast. How you doing? Karlene: I’m doing great Chris. Thanks so much for having me. Chris: Yeah, no problem. You know, you and I have been trying to meet for a while now and we just got on Skype here and you and I just talked for a half hour without even being on air so it’s going to be a great conversation with you today. I know that you’re a very inspirational woman in aviation. I’m so excited to hear your thoughts on some of these subjects, so thank you so much for taking the time out your busy schedule. Karlene: Oh, it’s my pleasure to be here. Chris: So one of the first things, I guess well, before that, what’s your profession? Tell everyone what you do, how you’re involved in aviation and that’s probably going to be a long answer because you’re quite involved. Karlene: I am very involved. I currently through my flying aspect, I am an A330 international pilot and I live in Seattle Washington. I’m actually on my 8th airline. And my current airline is the only one that still survives. So it’s been quite a journey and I’m type-rated on 727, 737, 757-67, 747 200 and 400 aircraft and A330 and my background in those seven airlines is I actually have a vast history in training pilots in a simulator and linecheck airmen also on the 747. So it’s been quite the journey, many airlines, many ups and many downs and quite a bit of time spent behind the scenes in the education process which probably helped induced me and pushed me into my current endeavor which I’m getting my Ph.D on aviation with a focus on safety. Chris: Great. And you’re getting that from Embry Riddle right? Karlene: I am. I am. Yeah. Chris: And above and beyond that, you’re taking your education kind of in another cool way which is through authoring. Tell us about that a little bit. Karlene: Yes I am. One of the things I’ve always wanted to do is write stories because you can imagine with the different airlines, especially the old school, old time things that went on, is I would see something and I’m thinking “Man, that would make a good story.” And so I kept putting it off and then finally I realized that the power of writing and the power behind the stories, how much we learn. You know, you think about somebody who’s teaching a pilot to fly and they say “You know what happened to me…” and they share a story and stories we remember and they impact us in so many ways. Books, they’re for entertaining, they’re for education and I’ve just found so much power in writing that I decided that I was going to write Aviation Thrillers and I would take real industry events and real life situations and create fiction novels around them. So my first book Flight For Control, actually the three accidents in there, anyone in the industry will identify them and how they happened are true to form. Why they happened is what I changed. And I put in the current environment with the bankruptcies and furloughs and lay-offs and then 1500-hour rule change and all the stresses and pressures that are within the industry at that time and that book came out four years ago. And how far could you push somebody in an industry, a safety industry that’s broken. And then with that, then I merged over and after all the bad things happened in that story, there was a merger. And with any merger, there comes issues with seniority and procedural changes and what not but the merger transition to one of my main characters went from flying a Boeing to an Airbus. And while she was flying this Airbus, an A330 was pulled out of ocean and found out that these pilots didn’t know how to fly. What a good plot point that is. And a lot of it’s about training and behind the scenes and why didn’t they know how to fly their airplanes. So Flight For Safety was formed based on that premise. And so the first book is kind of a lot of human factors with airline accidents in the industry and there’s even a theme of deregulation in there with what happened back and basically the story of Eastern Airlines, I had to change the names but you can read that theme if you understand what happened in their industry. And then it transitioned into more of flight. And so Flight For Safety, if anybody’s interested if flying an Airbus A330, there are numerous situations and incidents in that book that actually you can learn from. It’s like I’ve actually had pilots who are going for the check that have read my book and said “Okay, thanks. You helped me understand this concept on this airplane, why it did that.” So that has been kind of fun. So it’s more a flight book, what’s happening in behind the scenes in training and the big airline world. And then there’s a third book that will be coming out but that’s kind of on hold. And in the meantime while I’m writing these books, I speak quite a bit. I go out to different events and I mentor a lot of students and people around the world. And I came up with the book, and I’ve actually been working on this for about five years and I finally just had to make it happen and it’s called “Flight to Success: Be the Captain of your Life.” And it should be out on the market any day. We’re talking within the next two or three days. From hearing this, it should be up. And there are so many central themes of life lessons. I didn’t realize this when I wrote the book but I had four different readers evaluate it, read it, edit it and I didn’t realize that I kind of wrote a memoir in essence. Because what I did is I shared stories of my eight airlines and sometimes it was a step back and people said “Why did you do that?” And then in hindsight or actually just jump into the future, everything that looked like a step back actually was a benefit to me had I known. So there’s a lot of lessons in there. Anything we do, we were talking earlier about flight. Pilots are very mission-driven people. We always fly the airplane, we never give up flying. You know what? If you never give up doing something, you’re going to be a success at it. Just don’t give up, don’t quit. It’s about flight planning. Think of the elements of a flight planning. It’s like being accountable for what you’re doing and figuring out where you’re at and where you want to go. These are all goal-setting techniques. So I correlate that in the book. I’m really excited for it to come out. And there are stories, not only my own stories, but those of other aviators. We had one who kind of goofed off in college and high school. He was a 2.5 GPA student and one day decided he wanted to be a pilot and he goes into the recruiting office and they laughed, literally were laughing and said “You will never be a pilot.” And he only had I think maybe three or four years of time window before he can do it. So there’s this story of changing his mindset and behavior and how he made his life happen. There are stories of a friend of mine who at 48 years old got wrapped up in a big, high tech electronic company, making six figures but wasn’t living her passion. She quit to go to aircraft mechanic school, just quit. She’s put herself to school and she doesn’t even have guarantee of a job. But it’s like those kind of stories of courage. And a captain that I just shared with you who lost his leg and could go out on retirement, making more in retirement than most people will ever make in their life working full time, and he didn’t. He took that effort and that strength and the courage and just go and worked through the pain to make it a reality. In less than a year, he was back in the flightline after losing a leg. It’s just amazing. So a lot of incredible stories from people who are just so inspiring. Have you ever talked to Janine Shepherd? fly.” So her story is in there. It’s like there is a lot of flight gives so many powerful changes. Chris: I just wrote her name down as a potential interview. Karlene: Oh she’s wonderful. And actually one of the stories in my book I shared with is one of my daughters was paralyzed through back surgery and Janine Shepherd, they made a movie of her life in this incident. And I was watching a clip of when she was taking her first steps, being paralyzed and you can’t feel anything, but they put you up on the bars and I looked at that, I was watching this and was so emotional, I get tears in my eyes watching this and I’m talking to her, we’re both crying. I can’t believe, I said “That scene was so accurate to life because I watched that actress.” I said “That’s exactly the image in what I watched my daughter do when she was taking her first steps.” And Janine said, she was involved in selecting the actors for that movie and she says “That was the scene she selected that woman to play her.” Because of that, it’s so realistic. It’s phenomenal. Chris: Alright, so let’s get into Flight To Success a little bit more later because by the time this podcast comes out, the book will be out. So I want to encourage everyone to go pick that up. I know that myself, I’m going to get it as well. Let’s start off, let’s rewind the clock a little bit. How did you fall in love with aviation in the first place, tell us about that. And we got in this huge argument and I said “Yes I can” and she’s like “No, you can’t.” I said “Yes I can. Get out of my house.” So I kicked them all out of my house, game is over. I went up and said “Mom, I want to be a pilot.” “You can’t be a pilot” she says. “I don’t care what you do, get out of my kitchen.” And I say that jokingly because my mom has always been very supportive of everything, that you can do anything kind of attitude. But I was the middle of five daughters, we’re all about a year and a half in age. So we had a seven-year-old, an eight-year-old, nine-year-old, so there’s quite a few of us, my parents were divorced. So it was busy times, confusing times and I never had a clue what I wanted to do but I just made this declaration because I was told I couldn’t. So now fast forward I’m like 13 years old and I went on an airplane ride with my dad, my first time on an airplane. He was taking us to Disneyland and I went to the cockpit and said, “I’m going to be a pilot.” Right when I said that, I looked in the 727 and I saw all the switches and I’m thinking “There is no way I can do this.” And I was like devastated. I go back to my sit, I’m sitting there pouting thinking “I told everyone and they all said I couldn’t do it. My sisters are going to tease me and I was like how do I get out of this one?” But I just thought there’s no way. And then I came home and I pressed on. But I always looked back in that, why didn’t I not listen to that? And I jokingly said when we’re down in Disneyland, I saw an elephant with a feather. If he could fly, certainly a girl could fly. But I think reality is is I was in a location that was submerged in believe in yourself, anything is possible and so I kind of went on from this huge doubt to you can do anything, you can dream, you can believe. He talked to me about stirring with the rudders and adding the power and when the little airspeed got up to 65 knots to pull the airplane single back, and so I just did what he said. And I’ll never forget that moment that we broke ground and I thought “They’re going to pay me to do this?” I was like “This is incredible” and I was hooked. And I have to go back and say you think about teenagers and you’re living in a world where parents are telling you what to do, teachers are telling you what to do, there is peer pressure, there is hormones, there are all the stuff going on and it’s really a challenging time for a young person. You know what? Put them in an airplane and let them know that they really are in control of their life. That’s a powerful message there. That’s how it started. While I was going to school, I was working and spending every penny and going out to the airport and I did a home study and then go to the airport and take tests. So I just pieced it together at the very beginning while in high school. Chris: Great. And how old are you when you got your private pilot? Karlene: I was, I want to say I was probably 17. Because I graduated when I was 18 so yeah. Chris: And what was that experience like, do you remember that? Karlene: He says “Well, are you going to continue to fly?” And I said “Yes, is there a reconnection?” So I guess at that early stage, things happen and there’s great fear and it’s like “Okay, I’m never doing that again” but the interesting thing is this is a good lesson on perspective also because from my perspective, there’s an airplane there, don’t hit it, do what you’ve been trained to do and go around and just deal with the problem. From his perspective, new student almost gets hit by airplane, she’s going to be scared to death and never want to fly again. It’s just the different perspectives. So that’s actually, I remember that more than getting the pilot’s license for some reason. Chris: Wow, that’s pretty amazing. I mean, good decision making even at that stage. That’s pretty incredible. Karlene: Yeah. I’m just going to tell everyone, if you see an airplane, don’t hit it. Chris: Yeah. That’s a good rule of thumb for sure. Karlene: Yeah. And the fortunate thing is, think about this, think about this aspect and how things work in life. I was flying a Cessna, high wing Cessna. Had I been in an aircraft flying my solo in a low wing aircraft, I would not have seen that airplane underneath me and would’ve effectively gone right on top of it. Chris: So they were that close. They were on final approach sort of thing? Karlene: Yeah. He kind of ducked under me and it was kind of funny because the thing I remember I’m thinking “Wait a minute,” what was going through my mind is “I was here first. I’m talking to the tower. I’m on final approach. What’s he doing coming underneath me?” And then I remembered somewhere that the person who is the lowest has the right of way. And I just remembered that, “Okay, so he must’ve the right of way. I’ll go around and I can come back and I’ll come and land.” I don’t know what they were thinking or what they were doing, if they have been talking to the tower at that time. They could’ve just been slipping in, obviously they did not see me so they were just probably coming hopping from one airport to another and thought “I’ll just scoot in here. I’ve done it a million times.” But yeah, it was pretty funny. My primary rule is when you see an airplane, don’t hit him. So the type of airplane, I could’ve been a low wing aircraft and it would’ve ended differently. Chris: Right, yeah, and that’s happened many times for sure especially in that portion of the pattern. Karlene: Absolutely. And when you think about, I was actually just reviewing an accident in one of my courses where the airplanes came in and they were both low wing aircraft and they were both coming and turning parallel and so their wings are up. And so the bottoms of the aircraft essentially are facing each other and you have zero visibility and they just ran in to each other. They both of kind of overshot just a little bit and it was too much. Chris: Tell us about any aviation mentors you’ve had that have kind of helped you along the way. I’m sure you have many. It’s probably too many to mention but any mentors pop out when I asked that question? Karlene: Absolutely. One in particular, his name is Bo Corby, I wish I could tell anyone how to get a hold of him, I’ll see if I can find it in my email but he’s actually, he had a training center out called STI – Simulator Training Incorporated – and it was out in South Tennessee Tech Airport which was 10 minutes away from my house at that time. My kids were very small and I was waiting until they got older until I was going to start flying and I knew I had to get a flight engineer rating and somebody said “Hey, there’s a training center close to your house, go there” and they gave me the owner’s name and that was Bo Corby. I never forget I walked into the office and they had a 727, 737, and I think a Lockheed Electra simulator in there and a little link trainer. And so I walked in and there are four men sitting in the lobby. And they all stopped and looked at me. I’m relatively tall and at that time I was wearing a business-type suit with heels and Bo is about a foot shorter than me as it is. And so I walked in and these guys are all sitting and I walked in and nobody said anything. I said “Is Bo Corby here?” and somebody said “Yes.” And I kind of laughed, I said “Anybody going to tell me who he is?” And so this guy got up and it was Bo and he kind of walks over to me and he looks at the guys, kind of pops out his chest and says “I like my women tall.” I took my arm, wrapped him around and put him in a headlock and said “Good, cause I like my men small. That way I can put them under control.” And man, these guys just burst out laughing and that’s how I met Bo Corby. And so a month later I received a phone call from Evergreen and they said, well actually first they called STI to find out and got contact information and they called and they called and said “So, did you ever get your flight engineer rating?” and I said “Yes” and they said “We had somebody drop out of class, would you like to come to work for Evergreen?” and I said “Absolutely.” And they said “Do you have any problem being based in Terre Haute?” and I said “Absolutely not.” And they said “Well, okay, because you’re a low flight time, we’re going to have to set up a checkride and see if you can fly.” And so they’re going to set up a checkride in 727. And so what happened is I called over to STI and Bo had told me that they set up the simulator session. He says “Come on out here, I’m going to teach you how to flight a jet.” And for three days, he spent two hours a day in that 727 and he taught me core flight skills that I have carried through every type rating and every airline. I have never had a snag in a type rating because of those core skills that he thought me. He was such a fabulous training professional. And just the core, pitch and power and aerodynamic principles of flying this airplane. So I just kind of penciled it in. I didn’t have my logbooks or anything and I’m back there for a different job and gave it to him. So that had been three years removed. So now Bo is back there checking on my application. They said “Oh yeah, we have it but she needs to update it.” He told them I was flying as first officer at a 747 and because he walked in there and did that, I still hadn’t applied. I love my job. I was busy flying. I wasn’t there looking for something else at that time. Because he opened that door, they called me and that opened an entire new opportunity because of that. But back to the basic flying skills, he’s just a fabulous instructor. And he has a training center at Boeing Field and actually in my book Flight To Success in the back, every story of everyone that I share, I have their bio, their contract information and how you can get a hold of them and Bo was on the people back there and I have his phone number. He actually is the only phone number I put in this book for his business phone number and his training center. So if anyone wants a fabulous incredible instructor to teach you core skills, go spend a couple of hours with that man and he’ll be there. Chris: Cool. Sounds great. Well that was a great answer. It sounds like he really helped you at some critical times in your career. Karlene: Yeah. Go around. And so we went around, they kicked off and I’m sitting there thinking “How could you do this to me?” But he taught how to do this so I come around and then landed. It was one of those little voices “You should see her…” It’s like half of me wants to kick him. I’m thinking, “You know what, that was a lot of confidence building. You should see her do this.” Those are the little things. What I remember in the early days of flying and still do this, it’s kind of funny because when you’re really trying to focus, sometimes our minds have a tendency to drift and sometimes you’re focusing on something that you miss something else. And so in the early days, he’s saying “Okay, you’re on pitch, you’re on power. You’ve got your speed, you’re on course. You’re in glides up. Speed’s good, course.” So he’s saying these things to me. Kind of as he’s saying that, it’s like kind of making your attention go “I’m there, I’m there, I’m there” so you’re like really in tune, this real quick scan of assessing where you’re at and what you’re doing. And for many years, and when I’m taking a new checkride, I kind of do this to my mind. “Okay, you’re on course, you’re on glides up, speed’s perfect,” the important things. It’s like you’re descending in a vertical, speed’s perfect, you’re right on speed. And so I do that. And that came from that very early, gosh, how many years ago was that, 37 years ago. So yeah, mentors are a good thing. Chris: Definitely. And one thing I encourage all of our listeners to do is to find aviation mentors because they really do help you along the way. Finding a quality instructor when you begin and finding a quality instructor as you’re going throughout and latching on to people that you have symbiotic energy with and you can just gain a lot from them. I’m sure that you are one of those aviation mentors to many that have helped other people in their careers. So it’s kind of this pay it forward thing right? We not only need to find those aviation mentors but we need to be those mentors ourselves and promote aviation. Karlene: Absolutely. And something to all the students out there who are looking to fly, not everybody meshes with everyone. You may get with an instructor and they’re a great instructor but their personality doesn’t work with yours. And that’s okay. It’s really important to find somebody that you can work with. I’ve seen too many students thinking that it’s something about them because it’s not working. It’s not them. It’s just sometimes it’s just not a right personality match. It doesn’t mean they’re bad, it doesn’t mean you’re bad. You just have to get with the right person and you’ll do great. Chris: Definitely. So tell us about your blog a little bit. We haven’t talked about that a whole lot. What’s your purpose with your blog? By the way, it’s KarlenePetitt.blogspot.com correct? Karlene: Correct. And then you can also get it to KarlenePetitt.com and the link’s over there. And one day, I was planning on having a grown up website but I liked my blog, it’s kind of fun and quite honestly, my life is so busy between school and flying and seven grandkids so I haven’t had time to do anything. But I’m keeping up. Actually that blog is interesting because it started way back when I went to writer’s conference to write the first book. And somebody said, “You need to have a blog and you need to be on Twitter” and I’m like “What’s twitter and what is a blog?” And that’s how it goes to do that. Yeah. So it kind of transitioned and then when I was flying quite a bit, It would be different flights I was on or different situations and then it’s shifted a little bit because when I am on reserve, I don’t fly that often. And I like to support people and so I do like a Friday flyer and if anyone in aviation yourself included, I’d love to do a write up on you on how you got involved in aviation and photos and the story. And I don’t have a real strict format because everybody’s story is unique and there may be a theme in your story or maybe just what inspired you or some setbacks and how your learned from it, something like that. So I’d like to do that with many people. And then I like to support people in the industry. I do a lot of authors who are writing books or anyone who is doing something. Send me information, we’ll put it up there. I try not to make it, I want it personal. I’m not just saying, “Okay buy this.” I want to know the people behind the product, the people behind. So what it shifted from and to, it’s kind of growing in evolution but like today, if you went on today, there’s a new ruling on drones that just came out and FAA has just approved I think a few more categories, which they’re not called drones, I put that in there but they’re UASs – Unmanned Aircraft Systems. Chris: Yeah. All that new gray area they’re trying to figure out. Karlene: And the fascinating thing is while I’m working on this doctorate program, I never imagined how far along they are with some of this stuff. Karlene: Yeah, it’s amazing and it’s fascinating also that the unmanned aircraft systems, the accidents that are occurring are similar to airline accidents that we’ve learned from and it’s like “Okay guys, in your new world, if you’re going to be considered airline pilots, you need to come into our world and learn from our accidents so you don’t take our accidents and replicate them because when those airplanes are up flying around in light aircraft system, I don’t want to have them run into me. Chris: Exactly, yep. Again, going back to your first sole, avoid hitting other airplanes. Chris: Gotta get down so you can get your water gun salute. Chris: Great. Yeah, and your blog is really inspirational and although you have random stuff like the drone thing, it’s really all about passion for me. All of these things, they have a common thread in them that we can all learn from and just like you mentioned with the safety aspect of the UAS system, they’re kind of relearning some of those lessons they don’t necessarily have to. So there are just so many different little nuggets in aviation. I think being involved and reading online, reading the blogs, reading books, even communicating on twitter, I’ve really kind of upped my twitter game recently. And for some people that sounds silly but kind of my plan there is just to connect with other aviators and learn about what’s new in the industry and what’s hot. Keep your mind in the game even when you’re not flying. It’s definitely something that helps, blog is up with that. You’re part of Blogging Information right? Do I have that right? Chris: And that’s what several really great people, if I’m not mistaken Ron Rapp is part of that, Eric Auxier, who else is part of that? Karlene: Okay, I’m going to click over because I have a link on that. This is so that we don’t forget anyone. As you said Ron and Eric and then we have Brent Owens and Rob Burgon, Andrew Hartley, Mark L. Berry and Leland Shanel, he goes by Chip. So if anyone is interested in learning about any of these guys, if you go to my blog at KarlenePetitt.com, there’s a link on Blogging In Formation and then you can link in to each of those guys and directly to their website. So actually when we started it, it was to open up discussion and all of us in the first week of the month would put up blogs, discuss, and share each other’s ideas. And can you imagine how much time that takes. So now what we’re doing, we’ve kind of reformatted and each month, one person is going to run with the subject and then we’ll get involved and discuss it. And one thing that I’ve learned about this and it really opened my mind because I love Twitter and I haven’t been able to spend much time there lately because of school and obligations. However, I like popping over there and see what people are talking about. And somebody brought up “How do you feel about cameras in the flight deck?” And I had written a post on this. I went to search this blog and typed in “cameras flight deck” and it popped it up and I put the link on and said “This is how I feel.” And there was an individual in there who got very angry that I didn’t think that we should have cameras in the flight deck to the point of that I fly 14 hours and I’m sleeping while I’m flying and I’m like do you know what I’m thinking? Well, it’s a pretty good job if you can have it. I didn’t make the rules but those are the rules and that’s what happens. But it really made me open my eyes to it’s so important to be respectful with everyone. We all have our opinions. It doesn’t mean I’m write that we shouldn’t have them. It’s just my opinion and I back that up with being an instructor for so many years and watching what happens to many pilot’s performance if they’re being scrutinized and watched. It’s if someone is looking over their shoulder and they’re not focusing on what they’re doing, they’re focusing on who’s looking at them and that’s not a good place to be. And that’s not everybody. That’s just some people. And so based on that and what I’ve seen and experienced, I formed this opinion. But we all have them and the one thing that’s nice to do when you have an open mind is you can see other people’s opinions, search a little bit more. I’ve changed my mind on a couple things this year that I hadn’t thought about before. I remember this kind of a hot issue about ab initio pilots because I always have this image of these pilots, as long as they money, they can go buy their way into training. And then I had an opinion that some of the airlines that it wasn’t quite fair that a general aviation pilot who had that 1500-hours whereas a military pilot needs 750 and ab initio school i.e. like an Embry Riddle only needed I think, what is it, 1300? And you know, what’s fair of that because what if that general aviation pilot had a retired airline captain who’s got line experience, vast experience of flying, vast knowledge, is teaching that student and they’re working full time and flying on the side and building those hours, and they actually might be getting better training versus a school that is teaching a student who only has 250 hours, they graduate, they teach them. So where is the better experience? So I had these two mindsets. Well, now that I look into things more and opened my mind, I look at, general aviation, if somebody wants to fly, as long as you have enough money, you may not have the aptitude but if you’re at it for long enough, you can eventually get your rating. You can eventually get that license as long as you keep doing it and doing it and doing it. But whereas the schools have gate checks. If you haven’t passed at this certain point, you’re out of the program. Military, if you haven’t passed at this certain point, you’re out of the program. I hadn’t thought about that perspective before and I thought “Okay, I get it. I get it. There’s another little safety level in there so I kind of see that.” And like we were talking, I’m personally thinking that people who have, we’re using gliders but I think a cub time, a taildragger time, the smaller aircraft time are building better foundation skills than a complex aircraft. Chris: And variety in general, you know. I looked up that construct of their program and not anybody gets into it. Anyone can go out and say “I want to be a pilot” and go out to the FBO and pay the money and do it if you have a lot of money. But to go into his program, you have to go in and they give you aptitude tests somewhat like the airplanes do. There are certain test standards that you have to, psychological maybe, but there’s a lot of hand eye coordination, logic type things, tests that they do. And so they have to run to those tests and then they have a very rigid program where it’s condensed training. It’s like mine, I checked during two years or at least a year and a half, going out to the airport and just getting that private license because the weather is bad in Seattle and I’m going to School and I don’t have the money. So I pieced it, what I call it piecing it together. While those ab initio programs, they have the apps to go in and it’s very concentrated effort, energy that they’re getting and they also have gate checks so if they’re not set, they have to go back to their training. And so they get simulator training, aircraft training. And I don’t know if all ab initio programs but I was so against this and then I looked at what he was doing there and how they did it and they even had a program built in that none of the eight airlines I’ve worked for have ever done on the theory of jets, and the difference. It’s like I’m thinking “Any of us could go out and buy that book and learn it.” Do we, we don’t. You get into the airlines and you just focus on what you have to do to get there. So they have some extra things that are really beneficial that would be beneficial to every airline pilot and he built into that program because he saw the need. So I looked at that program thinking “Okay, he’s changed my mind.” It’s kind of hard to think that I’m like getting up there in my years and I’m changing my mind on things but that’s about being open-minded and when you hear stuff and you see it, if something bothers you about it, don’t fight it, listen to it and go research it and go “Okay, let me see.” You might be right. You might be right. I might’ve researched and looked at this program and go “Okay, this is [inaudible-0:47:40] because of ABC” but it wasn’t. It was very sound and very well thought out. But that 1500-hour rule, I completely disagree with that in essence. We talked earlier, I’m trying to work on glider flying. For all the pilots out there, do you know how many hours that you can actually use, and glider hours count towards total flight and they’re a lot less expensive. Chris: In a private pilot you mean? Karlene: Towards the 1500 hours, yeah. Chris: Oh okay, of course, yeah. Karlene: Yeah. But what we’re trying to do in my program, we’re going to petition to FAA, we’re going to try and improve through experiment that we’re designing that will show glider hours actually build better skills, situational awareness and decision-making than being on an autopilot while you’re building those hours and if we can prove this, we are going to attempt to petition FAA to reduce that total number of flight hours. Chris: And this is part of your degree right? Your dissertation, is that basically what this is wrapped around? Karlene: Right. And we didn’t plan on it. This did not plan on being my dissertation. My dissertation was going to be redesigning the A330 training program and this was in construct of a statistics occurs that my partner has a passion for small airplanes and she had read on my blog one day that I had written and it’s like two years ago that I had written, we’ve got three problems in aviation and here they are and here’s what we’re going to do to fix them. And one of them was this idea about promoting glider flying and reducing the hour of total time. So now we’re actually researching it and doing it. Karlene: Yeah. And it’s just these things, so hopefully, because you can fly a glider, you can get your glider rating at 14 which if you’re a young person who want to start flying and you can go to glider camps and spend your summer out at the airport. It’s not a lot of hours but it’s quality hours. Chris: You know, gliders have always been attracted to me. I’ve never actually pursued it heavily but I definitely believe in it and as we’re talking here, I’m doing a quick Google search of gliding in Alaska because again, going back to variety, it’s one of those things where they’re definitely skills from gliding that you just can’t learn anywhere else. I would imagine that once I do this and once I kind of connect the dots, it’s going to be a lot like flying a float plane for me where I went in and started doing my float training and I’m not completed with it yet but I started to learn a lot on what the aircraft does when it’s on the ground and how wind interacts with the controls, even how airflow interacts with controls in general even just being stationary on the ground because you can maneuver your controls in such a way that you get your airplane to push back into the shore or whatever or however you want. I’d imagine that for gliding it’s going to be a lot like that where you really connect some elemental dots and it’s got to be just super useful. Karlene: Oh it does. And you know what else Chris, as I’ve noticed, there’s a big push to get airline pilots to handfly their airplane. Quite honestly, the international flights, it’s a little bit more challenging because you’re fatigued, on the backside of the clock, it’s been a long night and you’re operating in environments where accents are very strong and so communication errors can be made easily. However, what I have noticed is they guys who kick off everything, altitude and fly their airplane are either small aircraft pilots on their days off or fly gliders. And those are the guys that have the confidence, it’s like n big deal. It’s just an airplane, kick it off. And so I found that kind of fascinating that they’re willing to do it. And it’s like not just gliders but small airplanes are going to do that to improve their performance. But we went for many, many years, three decades of FAA-mandated pilots to use automation and now we’re changing it. So there’s a lot of old school habits that we got to get back into the forefront and I think that we’re growing, I use the term we’re growing pilots up on automation, they’re learning on Cirrus aircraft, and the best thing a pilot could do is get core skills, without the autopilot, without the glass. And I remember when I was learning to fly, everyone said, “You got to get complex aircraft time because that’s what airlines what.” Well I think the airlines are getting smarter now. Chris: Wow. And do you know what time you’re speaking that day? Karlene: I do. Actually, if you go to, you can find it, it’s called the Northwest Aviation Trade Show on the 21st and the 22nd, and in the 28th there is a career day and the career day, I think it’s going to be at 9 a.m. They invited me to be the keynote speaker so I’ll be there at 9 a.m. and then I’m going to be sitting on two panels on the airline pilot panel with actually two other people that will be sitting there with me are both from Alaska Airlines and one of them is the person who’s in charge of hiring at Alaska. Karlene: And then I’ll be in the military aviation panel, guys coming out of the military looking a career in aviation so I’ll be in that one too. And it’s going to be a fun day. I think the career day is like 35 dollars and they feed you lunch and you get right up front one on one time with some people who are really active in the industry. And Alaska Airlines is very, if anyone has any desire to go work for Alaska Airlines, I think last year they hired 400 people through the conference. People are coming, even if you can’t make it to career day, if you come to the conference, you’ll walk up to the booth, they’ve got the people hiring right in that booth, right there, you got to meet them one on one and get your face there. It’s a very good place. And out here in Seattle Alaska Airlines is just a fabulous company. A good friend of mine just got hired there. They’ve got a great culture, a good operation and I travel a lot on them to go see the grandkids. Chris: Yeah, I’m looking at here, so 9 a.m. to 9:45. I might have to change my itinerary. I’m flying into Seattle that night so it’d be cool to come a day early and meet up in person and kind of see all these stuff happening. Karlene: Oh that would be awesome. Are you going to be down in Seattle for a while? Chris: Yeah, for a week and a half I think. Actually, the reason I’m going down there is because I’m going to the AvGeek Weekend. It’s like this other group that puts on kind of a group rate thing with Boeing where we go to the factory and we get kind of a special tour both at Everett and then the next day down at Boeing Field. So I am down there for aviation purposes. Well, I’ll actually be touring the Alaska Airlines Simulator Facility as well. Karlene: What days are AvGeek weekend? Chris: It’s the 20th and 21st so it’s during the weekend. Karlene: Okay. We’re going to have to get those AvGeeks connected to the Northwest Aviation Conference so they don’t conflict your dates. Chris: I know, for real, yeah, gosh. Karlene: I know. So now I got to plan that I want to go up there. You’re going to have a great tour. And actually, it might be something that you guys can do everything because the conference, the trade show is 21st and 22nd. Karlene: And if anyone comes to the trade show, I’m going to be at 124, I’m like right across. I got a primo spot. They must like me up there. But it’s kind of fun. I’m right down a couple booths away from Embry Riddle and a couple booths away from Alaska Airlines and right across from the information booth. Chris: So you will be there not just on career day but you’ll be there throughout the weekend? Karlene: Right. I’ll be there at the Jetstar Publishing Booth and I’ll have my new book there and I’ll have Flight For Control and Flight For Safety there, selling autographed copies. Yeah, and I give a really good fair rate too on the books so it’s pretty fun. Karlene: That’s alright. Should we go ahead and give them our phone numbers. Chris: Yeah, maybe yeah and our social security numbers, things like that. But that morning, I don’t think we start until noon so maybe we could make it down for at least several hours before our other gig starts and we could meet up that way somehow or maybe on Sunday. Anyway, I’ll try to figure something out because I think that would be really worthwhile to meet in person and get an autograph. Karlene: It would be awesome. You know what I’m thinking, how many people are going to be at AvGeek weekend? Chris: I think 200 people, it’s pretty big. Karlene: We should tell those 200 people to come on over at 9 o’clock to the Puyallop Fairgrounds and come in to the keynote speaker, they can come watch me do my very first keynote speak, that will really up the tension because they said there could be from 700 to 800 people there and the room can accommodate 1500 so with 200 AvGeeks at career day. I mean, even if they were there for the opening session and then went to a couple sessions, that would be kind of awesome. Chris: Yeah, that’d be great. Chris: Well I’m going to use my twitter prowess and I’m going to write the guy that is in charge of this thing and put a little bug in his ear about it, so we’ll do that. Karlene: You know what, we’d be so spectacular because here’s one thing that sometimes we forget to mention, the power of aviation. The most spectacular thing about aviation is the community. That’s something that I think when people get disgruntled at the airline level is because they had lost that sense of community because you no longer go to recurrent training and see all the people you’ve worked with in a big room. We have to currently train at home. Everything is so isolated anymore. So the people who lose their power of community. But you go out to any FBO, pilots want to help you. Man, that is a thing that I love, every pilot I’ve ever met, “Oh sure, come on. Let me give you a ride.” Everybody is willing to help everyone. They share their stories, give you a hand, that general aviation community. Those AvGeeks are awesome. Chris: And kind of wrapping into our conversation earlier, I guess the crux of all that and the conversations about all the different things you’ve learned online and the opinions on different matters and thank goodness it’s not politics, thank goodness we can talk about aviation and actually have a civilized conversation. I think that we are in an aviation renaissance right now. There is so much information out there and so much technology that’s allowing us to all put our heads together and figure out some of the bigger problems in aviation that have never been fixed and we have a real opportunity to do that. And the internet through blogs and twitter and through information out there and granted there can be bad information, but if we can all put our heads together and our passion together in that community, that really tight community that you talk about with AvGeeks, I think we’re going to be accomplishing many great things here in the very near future and I think that ball is already rolling and I’ve seen some of the effects of that. I mean, look at where we’re at right now. We’re on a podcast. You get to share your 30-plus of experience in the industry. I have the ability through some skills that I have learned to turn out into a wildly disseminated audio. I send it out all over the world and then we get reviews from Australia and Macedonia and the United Kingdom. So it’s really just this amazing time and we need to embrace it and just keep moving forward. Karlene: We do. We need to go with it. I actually read an interesting fact yesterday that Einstein never created any new knowledge, never did any of his own, created his own theories. Actually I should say he created his own theories but they were based on research of everyone else. What he did is he used his mind to read what others were doing, what they were thinking, what they were discovering and he pulled them together to create theories of his own, and that’s basically what you’re saying. Think what Einstein did, that’s all he did and today we have the world that you’re talking about, this globalization of internet that we can use for power. We are talking about the people breaking in cyber stuff and putting things on the internet that aren’t appropriate. We don’t need to use it on the bad side but for the good side, think of what we could do if everyone brings their information together, we keep an open mind and we build upon each other in creating more knowledge based on what we have. Chris: Definitely. And sharing in that encouragement too. I think that kind of brings me to my next question and probably my last here since we’re running up against time, and this will fit perfectly with your Flight To Success book and that is how do we encourage people that are on the fence to become pilots. And I’m not just talking about teenagers just like your story where you needed that environment in which people were encouraging you to take that stop and go along that path, but also the people that are now 40 years old, 40 to 55 age range that have the means now to afford it. What is your encouragement, what is your motivation for these people that are on the fence right now specifically with aviation but even if you have just some general common thread motivation there. I’d like to hear that. I’d like to kind of hear your spill on that. Karlene: You know, here’s the thing. It boils down to we have only one life. We have only one life and what I have seen in the central themes of people who are dissatisfied and tell the pilots “Don’t do this” is because they had expectations, they have some expectations of money or something they thought they were going to get and it’s when people live in their mind, they think that their enjoyment is going to be at some future date when they reached a certain dollar figure, certain positional power that they’re going to be happy. Everyone needs to take a huge step back, look at today and say “What’s my passion today? What’s going to make me happy today?” And if flying is going to make you happy today, do it. The question is not how do we get people to do it. The question is why not? And I actually took during one of the flying events, this gal, she was 35 years old, went flying for her first time ever, fell in love with it, she quit her job, sold her house and made her family move to Ellensburg because she was going to become a pilot. That’s awesome because it is. It’s having the courage and really bottomline is knowing yourself. What do you want? What do you value in life? People think that this journey, success is a place. Success is not a place. It’s how you live today, it’s how you live your life and passion and enjoyment. If you have the means to do it, the question is why not? If you go out and you do it and you don’t like to do something, of course don’t do that. But if you love it, it’s like you’re not going to take the money with you. Use it to do something worthwhile in your life and just enjoy today. Make it about today. There’s so much living in this moment. It’s so true. And I guess when you have a near death experience. It might happen, my son-in-law, he just recently was attacked with a baseball bat. He was literally shoo away from either becoming a vegetable or dead. And that close and life is absolutely that fragile. My neighbor last November, they were getting ready to celebrate their 48 anniversary and he was out riding the motorcycle and they don’t know what happened, friends turned around he was gone and found him dead on the side of the road. Life is that fragile. Bottomline is if today was your last day of your life, what would you do, how would you live it? Just practice living with passion and making the most of it. And it’s so much and for anyone wondering about this career, like any job, any job you go to you’re going to have fatigue, you’re going to have challenges, you might have burnout. No job is exempt from that. But this is absolutely, think about me starting over eight times. I have been furloughed, laid off, my airlines have shut down, starting over at the bottom eight times. I still love it because I love the adventure of learning and learning new airplanes and travelling. Am I tired when I travel to Amsterdam? Absolutely. But I met a really neat gal on twitter and so when I go over there, we get together and have dinner, how fun is that? Chris: Yeah, it’s so cool. Karlene: I know. When you were talking about twitter, I was smiling because I thought, I love twitter. For all the young people out there, you got to be careful because sometimes you don’t know who’s behind that face and that name so be conscious with that. But I have met some of my bestfriends on twitter now that I have actually kept in contact with and visit them when I travel around the world. It’s phenomenal. Chris: What you’re telling me right now is the journey. You enjoy where you are now and it may not be, it’s good to have destination in mind, you got to have a goal, but enjoy where you’re at right now because there is a lot of silver lining even in the difficult times or the times where you’re just building the thing that you’re trying to build. Karlene: It is. And it’s about passion. Somebody once asked me, she said “Wow, how do you keep your passion when you had to keep starting over the struggling times and I thought about that.” Well that’s an interesting question because it’s the passion that gets you through those struggling times. You don’t leave something that you have a passion for because times get tough. Times will always be tough no matter where you’re at. That is one guarantee. Just like the weather, you’re going to have sunny days and there are going to be stormy days and sometimes there is going to be a lot of hail. But you just have to appreciate the day and have the passion and if you do, you’ll persevere through those days. You’ll make it. Passion doesn’t go away. Now, if you don’t have a passion for something, I’d highly recommend finding it because it jazzes you. It really does. And one thing that’s kind of a side note is I love painting. I don’t spend enough time but I went with my girlfriend once to a painting camp and we’re learning how to do water colors. And I’m sitting there focused on painting this little picture with my water colors. And all of a sudden, eight hours has gone by and I’m thinking “Where did that time go? This was so much fun. But here’s the bad thing, when you’re doing something you love and you’re in the passion, time flies. Time is running out really quick. Karlene: But no, find the passion. That’s the key. Find your passion, live your passion. We’re in a world today where we have the ability to work and be fulfilled and get paid for it. Imagine that. Imagine doing that. And speaking of blogging information, real quick story. One of the most recent posts was about how people are losing their passion, pilots are losing their passion for aviation. Well, commercial aviation, what I do is completely different from general aviation. It’s not flying. Granted I am flying airplanes but this is a job and it’s a job that carries across the country in a highly automated airplane where I’m basically managing it. Yes I do fly it but it is not the same flight as you get home and you get in a little airplane and go fly around, and you do not lose your passion for aviation because you take a job flying airplanes. Because I know many pilots who go in their job and they fly their airplanes for their job because that’s where they grew up and they go home and hop in their little airplane. And they can afford that airplane. They can afford airplanes because they make a very good living at it and they can come home and play and have the fun of that passion of flying so they’re a little bit different. Chris: Variety in the journey. Chris: Yeah. I’m just going through your blog, seeing a lot of Seahawks stuff but that’s still painful, let’s not talk about that. Karlene: We’re not going to talk about that because that game literally, they threw the game away literally. Chris: Alright, we’ve run up against our time. Any last words Karlene before we head out here? Karlene: Well I should just say I just wished that everyone, figure out who you are, what you want in life and just live with passion, enjoy that energy, have a good time because it is good. And then take the time to inspire somebody else. Take the time to make somebody’s day. That’s kind of awesome. Chris: Yeah, pay it forward. Karlene: Pay it forward. We call it fly it forward in our world. Chris: Oh yeah, perfect. I like that. Karlene: Yeah. We fly it forward. Just inspire a child and open the door to a possibility is pretty incredible. Chris: And you know, if you’re not the pilot, if you’re the dad that got into the career that wasn’t aviation to help your family but you’re sharing your passion with your child sort of thing and you both love flying, you do RC, whatever it is, they may be the pilot in the family eventually you know. So just even something as something as that. Karlene: Yeah. And flight, for all those parents out there who don’t know whether they’re going to spend the money invested in their kids to go fly airplanes, you can do I, do it because it’s such a growth opportunity all the way around. and matters and suddenly the math and the science and all that stuff starts to make sense. Karlene: Absolutely. It really does. Chris: Alright Karlene, we really appreciate you spending the time with us. I’m looking forward to your new book. I’m going to get a signed copy. I’ll make it happen. I’ll find a way to get to the conference down there, and then everyone, go and check out Karlene’s blog, KarlenePetitt.com and that should forward you there, and again thank you so much for joining us Karlene. Karlene: Chris, thank you so much for having me and then at Career, when I walk up there, I want to hear all the AvGeeks say “AvGeek!” We’ll rock that room. Karlene: Okay great, thank you so much. Chris: Appreciate it, take care. Karlene: Okay, fly safe. Bye. Chris: Karlene, thank you so much for joining us on AviatorCast. It was very inspirational to hear from you and to hear what you’re involved in, trying to increase safety through the glider program that you’ve been working on and all of the advocacy that you worked on, all the sharing of aviation that you do through social media and through your wonderful books. We wish you the best success with Flight To Success so I’m really excited about that and I’m really looking forward to getting a signed copy when I head down to Seattle here. It was very great to have you on the show and I really appreciate you spending the time with us today. If any of you listeners want to check out anything that Karlene has done, I’m going to put show notes on the podcast page here so just go to aviatorcast.com and you can find the show notes there. KarlenePetitt.com. She’s also on twitter, she’s pretty active there, and again, she just released this great book. I’m really looking forward to read it, and again, thank you so much Karlene for joining us and we really look forward to having you on the show in the future again perhaps. We’ll just have to wait and see. So thank you for joining us on this episode of AviatorCast. We are so grateful to have you here. You are a great part of our community. Again if you enjoy this podcast, please review it on iTunes. This helps others learn about it so that we can move up in the ranks as one of the top aviation podcasts. I’d really appreciate that if you can do that for us. Also, if you want to leave a message for the show, you can do so at AviatorCast.com. Just scroll to the bottom of the page and you can leave a question there and get it read on the show. A really great way to kind of get some community interaction there. So join us next week. We are going to have to have Jason Schappert of MzeroA fame on the show. A great interview with him, he’s been a longtime friend and so we’re excited to have him around. Again, thank you so much to you listeners. You are what makes this podcast come back each and every week. We are so excited that this just keeps going on and on. We just have so many fantastic people come on this show and Karlene is just the latest and kind of greatest there. Each and every week, we’re just humbled by the great and wonderful aviators that are out there in the world. You are one of those great aviators. Keep up the fantastic work, and as always, throttle on!